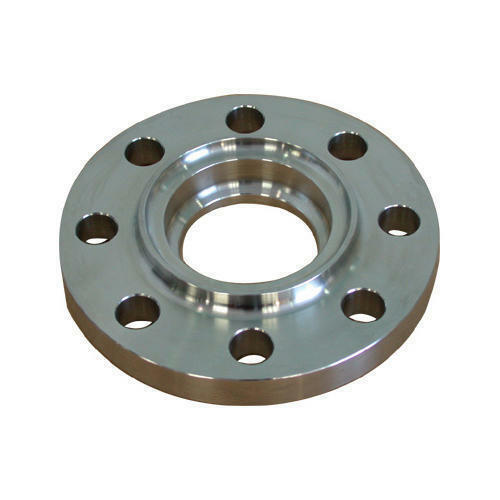 Socket-weld pipe flanges are typically used on smaller sizes of high pressure pipes. These pipe flanges are attached by inserting the pipe into the socket end and applying fillet weld around the top. This allows for a smooth bore and better flow of the fluid or gas inside of the pipe. Slip on Pipe flanges with a hub have published specifications that range from 1/2" thru 24". M P JAIN Flange provides Socket Weld pipe flanges in all material grades, specifications and sizes. Socket Weld pipe flanges are typically provided with a raised face, flat face, or RTJ facing. When a raised face is necessary for socket weld pipe flanges, the standard height is 1/16" for socket weld pipe flanges under 400#. For socket weld pipe flanges of 400# and up, the standard socket weld pipe flange raised face height is 1/4". MP JAIN Flange manufactures socket weld pipe flanges in all steel material grades, including carbon socket weld pipe flanges, stainless steel socket weld pipe flanges and alloy socket weld pipe flanges. M P JAIN Flange also has many different socket weld pipe flanges in stock and ready to ship.